Update Manager is available for all VMware vSphere customers that also run vCenter. It is a separate install on a Windows server that allows administrators to patch and upgrade ESXi-hosts but also to update virtual machines to the latest version of the VMware Tools and new virtual hardware. In this article I focus on these last two features. Note: As a prerequisite for this article you need to have vCenter Server and Update Manager already installed. Note: At the moment of writing this article (October 2013) the Update Manager plugin is only available for the vSphere Client on Windows. To update virtual machines to the latest version of the tools and virtual hardware supported by your host you should start in the Virtual Machines and Templates view of the vSphere Client. In that view select a Datacenter or a folder with virtual machines (or an individual vm, but in that case you could better just update that one vm manually). Next find the Update Manager tab which is the right most tab. Click Attach to assign a Baseline to the Datacenter or folder of virtual machines. Assign both dynamic baselines for upgrading the tools and the hardware. At this time the client will list the virtual machines as unknown. See the image below. 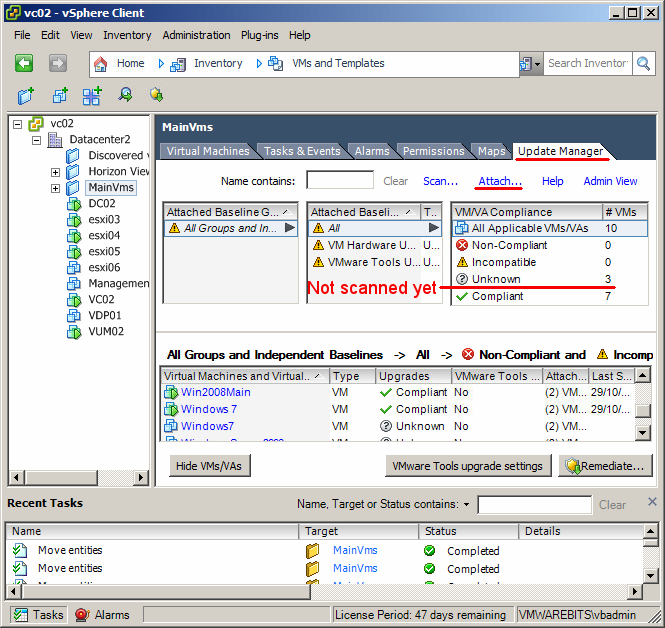 To find out what virtual machines need to be upgraded right click the datacenter or folder and select Scan for updates. This will update the dashboard with information about virtual machines that are compliant or not. Select the virtual machines to upgrade and click Remediate. You can now select what baseline to use for upgrading the virtual machines. 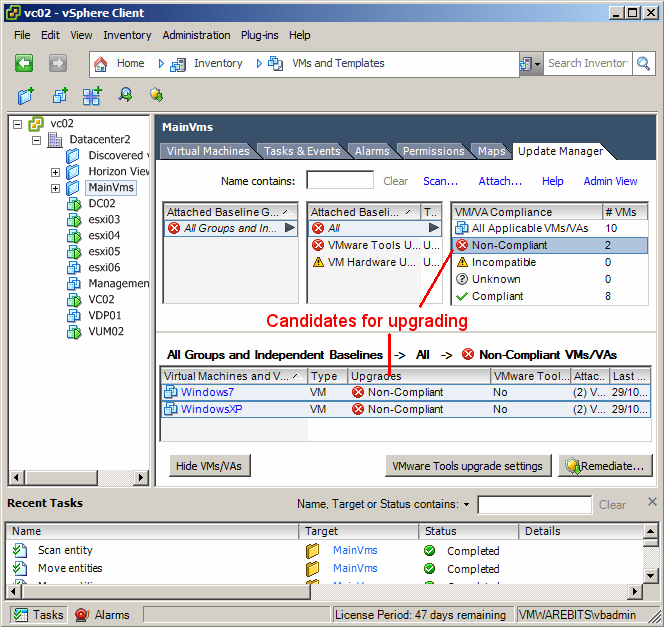 Always first upgrade the VMware Tools and in a second task perform the virtual hardware upgrade. The remediation task allows you to schedule the upgrade or perform it immediately. And you can configure to create a snapshot of the virtual machine before it is upgraded. When you click finish the tasks will be performed, you can follow this in the task panel at the bottom of the vSphere client. 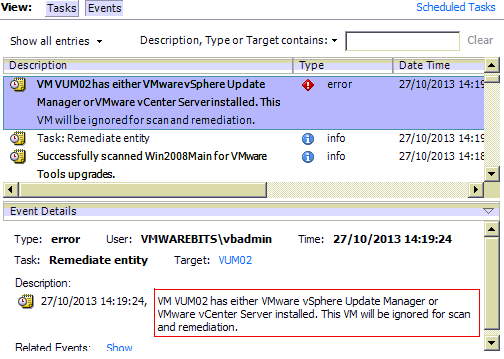 Tip: If your Update Manager or vCenter itself is running as a virtual machine you can not update it with Update Manager. To upgrade that virtual machine it depends on where it runs. If it runs on an ESXi-host that you can login to directly with the vSphere client then do that to perform the upgrade. When the entire process is done and you want to check if indeed there are no virtual machines in your environment that need to be upgraded you could use the vSphere Web Client's filter capabilities to find virtual machines that are not upgraded yet. This is explained in this article: Finding virtual machines that need a hardware upgrade.